The oldest violin in the shop is from 1650. Thirty years after the Pilgrims set foot on Plymouth Rock, this piece of wood and string existed somewhere in the world, making music for people it would be destined to outlive. Now it sits, anonymously, among hundreds of others in Peter Prier & Sons Violins in downtown Salt Lake City. An object that has survived as long as this instrument should be in a museum, but why imprison something behind glass when there's still music to be made? Violins are one of the few instruments that sound better as they get older, says shop owner Daniel Prier. The drier the wood, the better the vibrations that emanate from its body. You want that soft, nasally sound that hums and vibrates as closely as possible to the way a human voice does. Anyone who has seen a master violinist perform knows how spellbinding it can be to watch someone coax authentic human emotion out of an inanimate object, and the better-acquainted a violin is with its human interpreter, the more exquisite its sound. 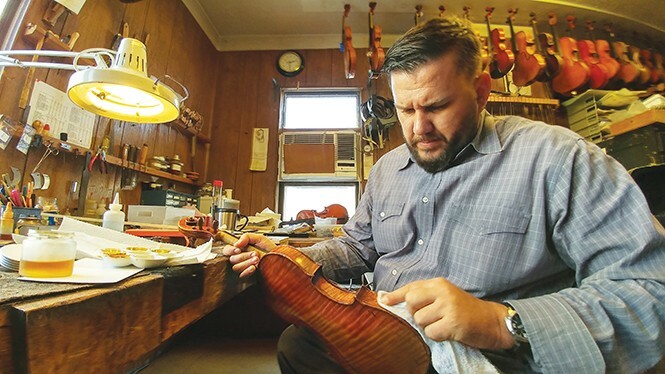 The best ones have lived through generations of performers, but behind the scenes are people like Prier—craftsmen who repair and nudge violins along a musical path that could last centuries, as long as they're left in the right hands. "There's a little bit of my soul that goes into every repair job," Prier says. He's the youngest son of Peter Prier, a German immigrant who studied violin-making in Europe before opening his shop in Salt Lake City in 1965. He would later open the Violin Making School of America right next door. Daniel took over the shop and school after his father died last year, but he has spent most of his life learning about the art and business of violins. It's a stubbornly Old World craft. The technology behind how the strings and bow work with the wooden sound post on the inside to project the sound through F-holes hasn't changed much in hundreds of years, and neither has the technique of making or repairing the instruments. Stepping into this shop almost feels like a journey through time. Violins hang on the walls and in neat shelves in a back room on the first floor. In the repair shop on the second floor, employees work to repair a dismantled cello sitting on a custom-built table that adheres to the instrument's specific dimensions. You have to "MacGyver" a lot of things in this shop, Prier jokes. His workbench sits in another room on the second floor. Spare bridges, screws, strands of horsehair and other pieces take up whatever spare space they can find on walls and flat surfaces. Prier picks up a violin he needs to re-string and starts smoothing out the neck. Players need to feel like it's been worked on when they get it back, he explains. "People want to see hand work." Prier uses hand tools only. You don't hear the whine of electric saws or industrial-grade tools here. It's quiet for a repair shop. All you hear is music and work. "I make my own tools," Prier says as he shows off a pocketed cloth laid across his bench with wood-handled files, awls and chisels. When your craft involves such hyper-specific verbs as "purfling" (inlaying an ornamental border around the edge of the violin's body), you can't really count on picking up what you need at Home Depot. Prier takes some comfort in his status as a craftsman in an increasingly automated, mass-produced world. He isn't intimidated by the prospect of people buying a cheaply made instrument at a lower price than what he offers. It's his job to convince people that his way is worth it. "It's constant education," he says. "There are a lot of things about the Old World way that make a lot of sense."